Early books of hours have types of pictures and decoration which tend not to appear in ones made later on, after the programme of subject matter for pictures and decoration became established. This book of hours includes unusual pictures and texts, such as the Hours of the Holy Spirit and of the Passion, which were exceptional in a prayerbook of the mid-13th century. Some of the texts were recommended in contemporary treatises for the devotions of anchoresses, suggesting that it was made originally for such a religious woman. Its calendar of saints' feasts include many that were associated with the West Midlands. The Hours of the Holy Spirit are short, consisting of only a hymn, an antiphon (a verse sung in response) and a short prayer: This page begins the hour of terce or about 9 am, itself among the shorter hours recited during the day. 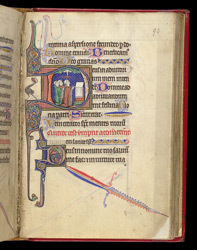 The first letter of this book's hour of prime is historiated (bears a picture) showing three clerics kneeling before an altar, above the Holy Spirit with red lines radiating from its beak descends from the top of the letter. This is an example of the unusual subjects chosen for the hours in this manuscript. Possibly it may be a version of one of the subjects designated for contemplation at terce, the descent of the Holy Spirit.